December 11th, 2014 – Samabe Bali Suites & Villas was announced as the Indonesian winner in the category of Luxury Family All-Inclusive Hotel at the 2014 World Luxury Hotel Awards, a consumer based program aimed at showcasing and encouraging the highest standards of service within the luxury hotel industry. 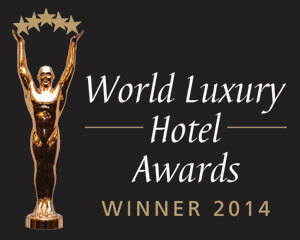 The World Luxury Hotel Awards are presented to the winning hotels and resorts in a variety of categories as recognition of their commitment to the supreme level of service. They are determined based on customer reviews submitted to the organizing committee, thus directly reflecting guests' experiences and opinions. The awards are adjudicated within the global and regional locations, with judging criteria covering the facilities and customer service excellence, whilst the size of property is not taken into consideration during the nomination or voting phases. "We thank our guests for their support, without which this achievement would not be possible. This recognition is a great honor and it once again confirms our reputation as the leader in luxury all-inclusive accommodation in Bali" said Ralf Luthe, General Manager at Samabe Bali Suites & Villas.